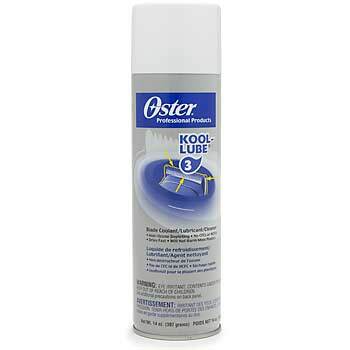 Oster blade coolant, lubricant and cleaner. A quick, effective lubricant that provides instant cooling, lubrication and cleaning for your clipper blades. Simply spray KOOL LUBE 3 through the clipper blades occasionally during use. The results are reduced friction, heat and blade wear. There is no heavy residue. This is a non-Ozone depleting product. No CFCs or HCFCs. It dries fast. It will not harm most plastics.